When Wendy’s 16-year-old brother falls from a fourth-floor window in Reading, England, the verdict is suicide. But she doesn’t believe it. So was it an accident? Or worse? As she unravels the mystery, she finally discovers what, or rather Who, the truth really is. ‘A gripping read.’ Outstanding!’ Great gift for young adults! Essential for your handbag or briefcase, this smart, unique, pair of follow-up booklets is for giving to new believers. High quality and attractive, they use parables and explain all basic terms. Plus they include 1/3 of Mark’s gospel. Ideal for events or outreach. We sell them at cost. A high-quality, 8-page (incl cover), A5 booklet presenting the gospel clearly and compellingly. Keep some handy! We sell them at cost. More exciting aids to help you extend the Kingdom of God! Do you look at the view? Or the flies? Also available on Amazon and Kindle. ‘Really valuable!’ Street evangelist. Give the first free when you lead someone to Christ. Give the second when they come to church! So What? Thousands printed, and many have come to Christ. Jesus is our example! Let’s do what he did, and not what he didn’t! Be prepared for some surprises as you learn how Jesus healed, and taught us to do the same. 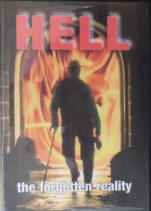 Hell - the forgotten reality BEST SELLING CD When this message was first preached, the church rose to its feet and worshiped for a whole hour! How can a God of love have invented hell? Is it real? Do the lost really go there? This amazing message shows us that if God is holy and loving, hell is an inevitable consequence. Is he real? Is he right? Is he relevant? Jesus’s parents took him to Jerusalem, and promptly lost him! They made three vital mistakes (that we all make too)! This powerful evangelistic message has led many to find Jesus for themselves. A vital message on the power and uniqueness of the New Covenant, and why it cannot be broken! Also includes the TRUE meaning of Shalom and its importance for healing. Joseph & Mary lost Jesus when he was 12. They made the same three mistakes we all make too! Covenant of Peace “We need to hear this over and over.” “Powerful message”. Essential for your handbag or briefcase, this smart, unique pair of follow-up booklets is for giving to new believers. High quality and attractive, they parables and explain all basic terms. Plus they include 1/3 of Mark’s gospel. Ideal for events or outreach. We sell them at cost. Gospel tract. A high-quality, 8-page (incl cover), A5 booklet presenting the gospel clearly and compellingly. Keep some handy! We sell them at cost. 3-CD set. This shorter version is an ideal place to start! Thousands have been healed in these schools. How can a God of love have invented hell? Is it even real? This amazing message shows if God is holy and loving, hell is an inevitable consequence.